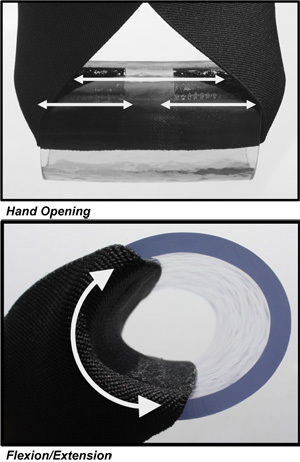 Follow the directions below or click here for demonstration and education videos. Need help determining the right size sling? Click here for our Sizing Guide. Initial fitting by PT or OT is recommended to ensure proper fit. Position the UNLOCKED 4-Tab for optimum comfort and function. AVOID placing 4-Tab on base of the neck. Greater comfort is typically achieved with the 4-Tab located low on the back (about the level of the bottom of the shoulder blade). ALTERNATE POSITION: Locate the 4-Tab over the lower half of the shoulder blade of the involved shoulder. AVOID placement over any boney prominence. 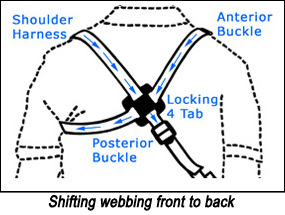 Occasionally, lower 4-Tab position can be achieved by shifting webbing from front to back (see below). 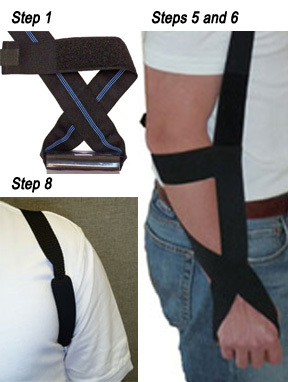 To do this, move anterior buckle toward the 4-Tab, work the extra webbing through the 4-Tab, around uninvolved axilla (readjust axillary pad position) and through the 4-Tab again toward the posterior buckle. The 4-Tab can then be moved lower on the back. This adjustment can also be used to relocate the anterior buckle. Optimal wrist control is achieved when wrist cross is directly over the wrist joint. This adjustment is rarely needed and should be made by a therapist. Once fitted by therapist with 4-Tab Buckle secured, no further adjustment should be needed. With training and practice, many clients are able to don and doff the sling independently. What is Shoulder Subluxation and How Does the GivMohr Sling Help?